Overview - During the Manchurian-ruled Qing Dynasty, Emperor Yong Zheng established a secret assassination squad known as the Guillotines to eliminate all who opposed him. Once heavily favored by the Emperor, the Guillotines are deemed expendable once Emperor Qian Long ascends to the throne and adopts Western ideas and technology. To consolidate his power under a new regime, the Emperor continues to use the Guillotines to persecute the conquered Han Chinese in a reign of terror and oppression. Though I'm aware that the concept of the legendary flying guillotine may in fact be based in reality, I have this sneaking suspicion that the crazy, intricately mechanized, sci-fi inspired, boomeranging, spinning blades of death featured in Andrew Lau's 'The Guillotines' might be a slight exaggeration. OK, slight is probably a pretty big understatement, but this decidedly "stylized" take on history can be fun. Unfortunately, ignoring a few solid action scenes, the movie's uneven storytelling leaves a lot to be desired. The blades may be sharp, but most of the film is surprisingly dull. The Guillotines are an elite enforcement squad charged by the Emperor to eliminate enemies. To do this, they use "special" UFO-shaped propelling blades that lock onto targets and cut off their heads. Tasked with killing a rebel called Wolf (Xiaoming Huang), the group becomes embroiled in a bloody conflict involving a revolt among the subjugated Han Chinese. But as their journey to capture the supposedly nefarious insurgent takes various twists and turns, they start to question if they are fighting for the right side. Betrayed by the Emperor, the team is eventually hunted down, and faced with possible execution, they battle for their lives. The opening sequence offers an explosion of aggressive action, thrusting us directly into the complicated plot with little preparation. Sure, a half-hearted opening voice over and title card try to establish some backstory, but really, we're mostly left to our own devices to figure out what the hell is going on. Fists fly, spinning blades of death swoosh through the air, and heads roll (literally) -- and while the action-packed carnage is exciting, it's also chaotic and overwhelming. To their credit, the filmmakers do offer some cool stylistic flourishes, throwing in slow motion choreography and a repeated visual motif where we zoom into the churning mechanisms of the characters' intricate and bizarrely anachronistic weapons before they unleash hell, but the storytelling beneath the flash is a bit troubled and some of the effects work is decidedly dated and cheap looking (I occasionally had flashbacks to 'Mortal Kombat' and 'Stargate'). Early sequences are especially choppy, and it almost feels like the movie is on fast forward, liberally skimming through basic plot points and character setups to reach more action. This leads to a very clunky and haphazard pace. Likewise, due to the thin scripting and bombardment of fight scenes, the story can be a bit confusing and hard to follow. The members of the Guillotines themselves are especially difficult to distinguish between and sadly, with few exceptions, they really aren't given distinct personalities or subplots of their own. This dearth of real development makes it hard to invest in their initial plight. Thankfully, though, as the runtime evolves, the story does eventually find an engaging rhythm -- even if it is too little too late. The film mellows out considerably in its second half, giving dramatic beats more time to grow. As we learn more about Wolf's true motivations, the plot actually takes a few interesting turns, sidelining action for solid character moments and conflicts. While this works to help flesh out bits that were neglected earlier on, this slower storytelling style does feel at odds with the previous action-oriented stretches. With that said, the movie's climax is still full of explosions and carnage, and all of this on-screen excitement is handled well. Oddly, though, the sci-fi inspired flying guillotine weapons basically disappear in favor of more period appropriate armaments, making their inclusion in earlier scenes all the more jarring. The ending itself is also rather problematic, essentially nullifying all of the costly bloodshed that came before with a simple speech. If talking is all that was needed, why the hell didn't someone try that in the first place instead of, you know, all the decapitations? Despite a solid amount of action, the movie's disorienting structure, lack of character development, and choppy editing lead to a mostly monotonous, confusing, and unengaging experience. The flick becomes more engrossing in its later portions, but these improvements can't quite make up for the mediocrity that comes before. I'll give the filmmakers a few points for the sheer, silly audacity of the title characters' elaborate weaponry but, even then, the crazy boomeranging blades of death end up disappearing in the third act. I mean, if you're going to open with crazy boomeranging blades of death, you damn well better close with them too! 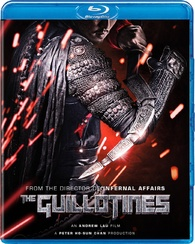 Well Go USA brings 'The Guillotines' to Blu-ray on a single BD-25 disc housed in a keepcase with a cardboard slipcover. After some skippable trailers the disc transitions to a standard menu. The packaging indicates that the release is Region A compatible. The film is presented in a 1080p/AVC MPEG-4 transfer in the 2.35:1 aspect ratio. Though converted to 3D for its theatrical run, only the 2D version of the film is included here. Uneven but occasionally impressive, the movie's first half proves to be more problematic than its later portions. Shot on the Arri Alexa and Red Epic, the digital source is a bit inconsistent. Spikes in noise and minor banding (particularly during transitional fades) are common and a good portion of the runtime has a fairly flat, faintly compressed, low grade appearance. Detail is solid, but certain scenes look a tad blurry. Thankfully, the film's last act features a much more impressive look, with improved detail and dimension, showing off the impressive natural landscapes and meticulously designed costumes. Colors are fairly drab, mostly sticking to a golden or blue/grey palette, but certain hues offer some slight pop. Contrast is even, though blacks can appear somewhat murky in darker scenes. 'The Guillotines' has some impressive shots, but the overall transfer is uneven, and the image is prone to a faintly electronic look that can be unappealing. The movie is provided with a Mandarin DTS-HD MA 7.1 track and an English dub DTS-HD MA 7.1 track along with optional English subtitles. Loud and aggressive, this is a lively and immersive mix that does the film's many action scenes justice. Speech is clear and crisp but at least some of the film's dialogue appears to have been added in post, leading to a slight disconnect. With wide range and spacious dimension, the tracks offers an enveloping soundstage. The front and surround speakers come alive with effects work, spreading galloping horses, swooshing blades, gunshots, flying arrows, and spinning guillotines all around the listener with precise directionality and imaging. Delicate environmental ambiance, like burning embers on a fire, is also conveyed with pleasing fidelity and depth. The film has an action heavy focus, and these scenes are all appropriately bombastic with powerful low frequencies, particularly during several on-screen explosions. The movie's epic music score features strong presence and separation as well. Rousing and dynamic, the track does a great job of enhancing the film's action and drama. While the effects work can be a little overbearing at times, the sound design is well implemented, and the audio should give your surround system a solid workout. Well Go USA has put together a small but decent collection of supplements, including interviews and a behind-the-scenes look at the film. All of the special features are presented in 1080p with Mandarin LPCM 2.0 and English subtitles. It should be noted, that if you select one of the features, the rest will continue to play without the disc retuning to the main menu. Interviews with Cast & Crew (HD, 38 min) - Interviews with director Andrew Lau, costume designer Dora Ng, and actors Huang Xiaoming, Ethan Juan, Shawn Yue, Boran Jing, and Li Yuchun are included. The clips are viewable separately, but if one selects the first interview they will also all play in succession. The participants discuss their characters, the real history behind the story, costumes, and how they went about designing the look of the guillotines. Making of (HD, 17 min) - Here we get a solid behind-the-scenes look at the film with on-set footage and interviews with cast and crew (some of which are repeated from the previous featurettes), covering the story, characters, and stunts. 'The Guillotines' is a mediocre, clunky, and slightly confused "historical" action flick. The stylized fight scenes and battle sequences are entertaining enough, but it takes too long for the film to even out the inconsistencies in its pace and tone. The video transfer is similarly uneven, but the presentation gets progressively stronger. Thankfully, the audio is appropriately bombastic throughout. While not packed with supplements, the interviews and behind-the-scenes featurettes are solid. Factoring in the movie, technical presentation, and extras, this disc is a rental at best.